if you are pictured in any of these photos and are listed as unkown, please contact me! 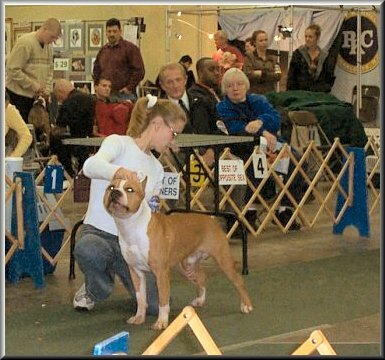 Melanie Davis of Blazin Amstaffs with Cannon, unkown, unkown, Teresa Burnett of Empire Kennel with Big Man, unkown. 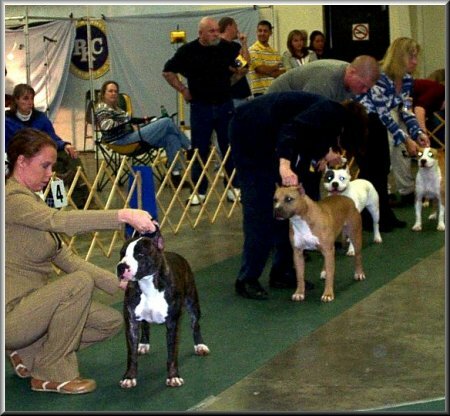 Jamey Scott of Kachina Kennels with Johnson, Dorian Grumbar of Juno's Pride Kennels with Gabby, Me with Peanut from White Tip Kennel, Sam Campbell of Campbell's Pride Kennel with Kujo, Tim Nichols of Nichols APBT's with ?, unkown, unkown and unkown. 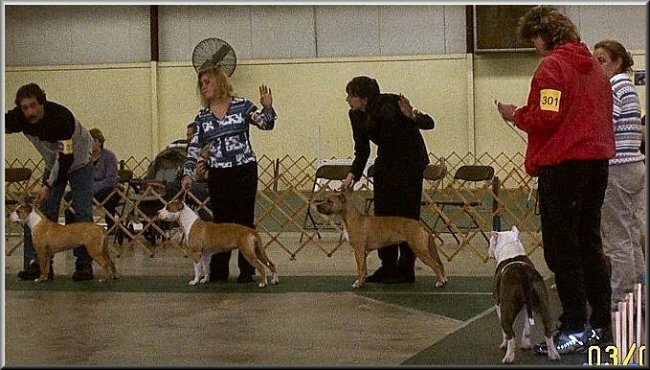 Rolando Mata of True Kennels with ?, Teresa Burnett of Empire Kennel with My Own, Melanie Davis of Blazin Amstaffs with Gypsy, Lori Divine of Divine Amstaffs with Dixie and Kathy Mongan of Majik Kennels with Alyiah. 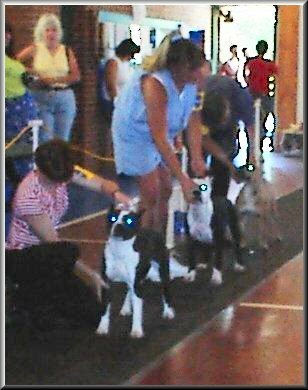 Melissa Scheigert of Showstar Kennel with Dollie, Kathy Mongan of Majik Kennels with Alyiah, Shane of Delmarva Kennels? 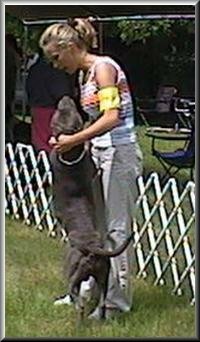 with Molly and Dorian Grumbar of Juno's Pride Kennels with ? 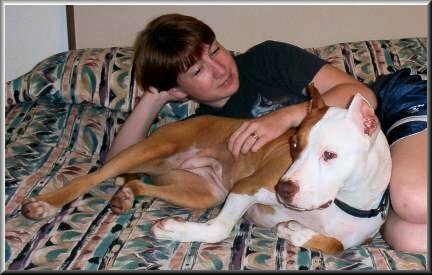 Everyone with an American Pit Bull Terrier Please raise your hand! 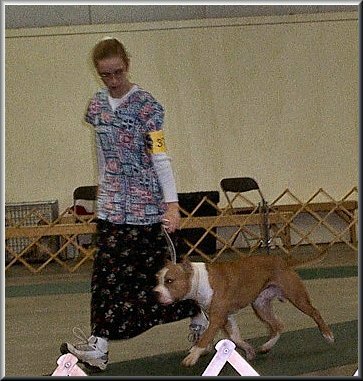 Warren Shaw of Shaw's APBT's with ?, Dorian Grumbar of Juno's Pride Kennels with ?, Kathy Mongan of Majik Kennels with Alyiah, unkown and unkown. 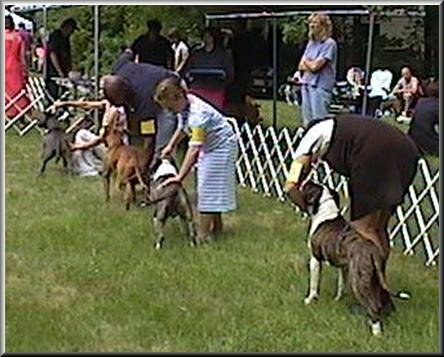 Aimee of True Kennels with ?, Dorian Grumbar of Juno's Pride Kennels with ?, unkown, Kathy Mongan of Majik Kennels with Alyiah, Shane of Delmarva Kennels? with Molly and the rest are unkown OR i just can't see, lol. 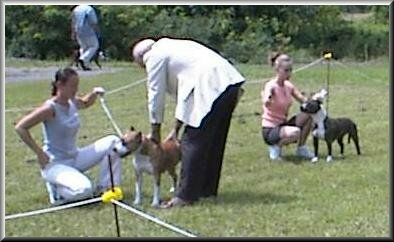 Me with Wrangler, Melanie Davis of Blazin Amstaffs with Cannon, Sherry of Arch Angel Kennels with ? You want us to do what?! Wrangler in Senior Male class under Arlene Grimes. if you are in any of these photos and listed as unkown, please contact me! Me with Romeo, Tara? of ? 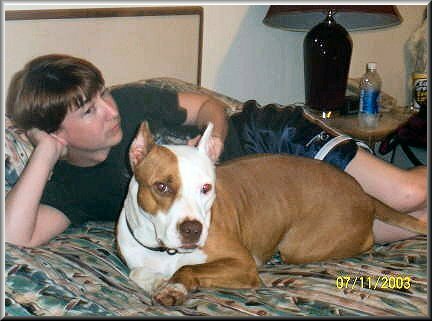 with ?, Tonya Cannon of Fry's Amstaffs with Rain, Scott? of ? 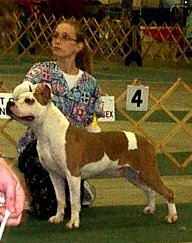 with ?, Teresa Burnett of Empire Kennel with Patch. 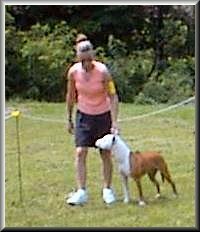 Michelle Arnold of White Tip Kennel with Mystique, Sherry of Arch Angel Kennels with ? and unkown. and here we are again, doesn't Dreamer look thrilled? 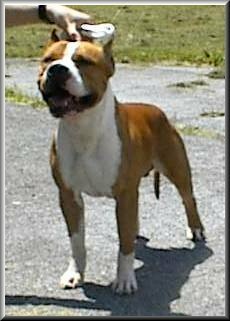 Peanut of White Tip Kennel claiming he REALLY isn't hot, lol. Dreamer says "What was that?" Some of these photos were taken by me and some of them were not, if you took any of these photos please contact me so that i can give you photo credit. 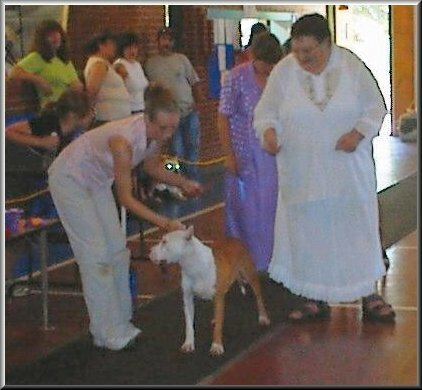 Lori Divine of Divine Amstaffs with Patch, Sherry of Arch Angel kennels with Gabriel, Michelle Arnold of White Tip Kennels with Peanut, unkown, Me with Storm and unkown. 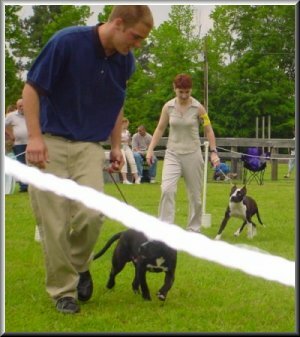 Jason Davis of Blazin Amstaffs with ?, Michelle Arnold of White Tip Kennel with Mystique. 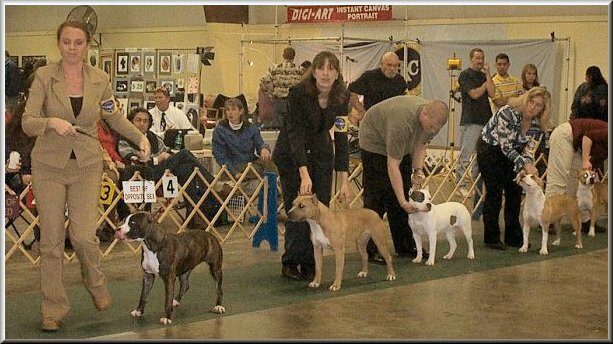 Me with Romeo, Okye Lasster with Torque, Tristan Quintal of SkyBlue Amstaffs with Jagger and Beth Jones of Blue Moon Kennels with ? Romeo getting lovin before taking Best Of Winners. These photos were taken by my husband. 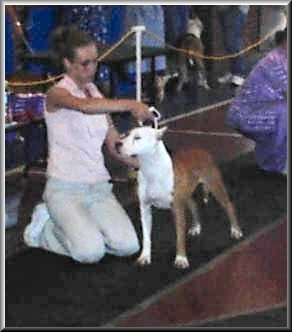 Me with Storm, Linn Brown of Pitstaff Kennels with Ratchet, Lee Fitzgerald of Fitzgerald's APBT's and AST's with ?, Bobbie Moorhouse of Private MD's kennel with ? and unkown. 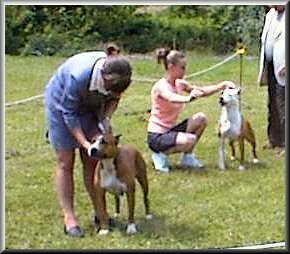 Me with Storm, Linn Brown of Pitstaff Kennels with Ratchet, Lee Fitzgerald of Fitzgerald's APBT's and AST's with ?, Bobbie Moorhouse of Private MD's Kennels with ? and unkown. If you have additional pictures from any of these shows we would love to post them here. Also if you have pictures from past shows that we personally have attented we would also be happy to post them!